The cutting-edge Elite Winter 2016 Cardio Collection combines sleek design with high-quality materials, the result? 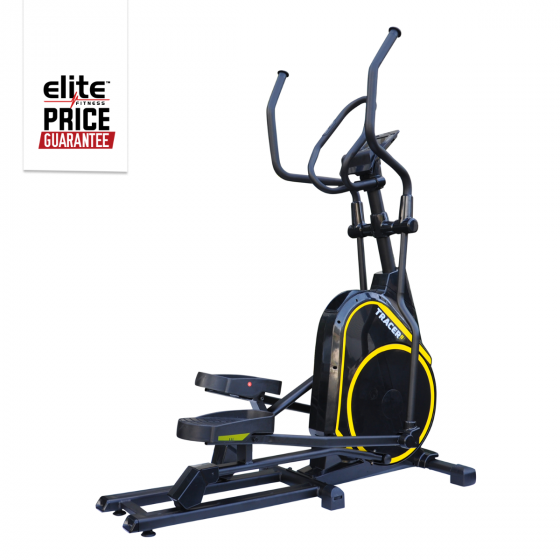 Elite Tracer 8 Cross Trainer. With this machine, you get the best of both worlds, affordability and durability, as well as supreme construction. The Tracer 8 features an Easy-to-Read LCD that keeps you informed of important workout statistics as you exercise - Speed, Distance, Time, Calories Burned and Heart Rate. If you like to mingle exercise with entertainment, the convenient book/tablet holder will keep your valuables secure as you work out. Cross training is an excellent way to target and tone lower body muscles, however, feel free to transform your routine into a full body workout using the Upper Body Arms function. 9kg Heavy Precision Balanced Flywheel and 16 Levels of Magnetic Resistance provide for one of the smoothest and quietest rides available. The Tracer 8 also offers an extremely natural walking movement with an 18" long stride, making it very easy to use. Console: Dual Colour LCD Displaying Program, Calories Burned, Speed, Heart Rate, Watts and Distance. Flywheel: 9kg Heavy Precision Balanced Flywheel. Stride Length: 18" stride activates the most muscle within the elliptical motion. Front Drive System: Creates a natural motion and keeps your body in a good biomechanical position.